The world's largest solar plant has got planning approval in the US. This proposed facility would generate 1000 MW (1 GW) of clean, renewable energy - this is four times the size of the largest plants so far, and rivals the output of large conventional fossil fueled electricity generating stations. The proposed £3.8 billion-plus plant which is to be situated in desert at Blythe, California on the California/Arizona border, won clearance to build from the California Energy Commission. 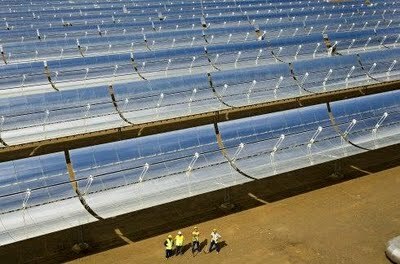 The importance of this project is as a large-scale prototype for the sort of giant solar plants proposed by the EU's Desertec plan - which expects to site them in North Africa - and other large enterprises which could generate a lot of solar power using CSP. The US proposal favours the Parabolic Trough method: a large polished metal mirror concentrates the sun's rays on a vessel containing liquid and heats it up to drive steam turbines which create electricity. The Blythe station will consist of four linked 250 MW generating plants, which are expected to power up to 800,000 homes. The plant was originally proposed by Chevron Corp. and Solar Millennium AG, although, according to Reuters, there seems to be some doubt as to whether Chevron will continue with the project, leaving Solar Millennium and Ferrostaal AG as the sole two co-developers, working through a U.S. joint venture, Solar Trust of America LLC. The developers have already struck an agreement with Southern California Edison, which has said it will purchase the full capacity of the first two plants. Although there are various legal and planning stages to go through before the plant is given complete approval, this is a major step forward. 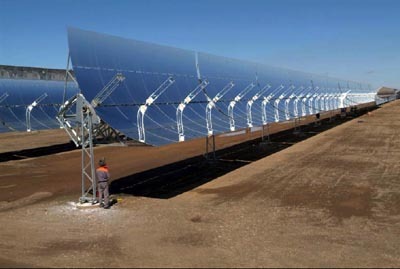 The principle behind Concentrated Solar Power (CSP) is a well established and rather low-tech way of generating power. Research into this technology started in the 1860s! The first CSP station was built by John Schuman in Egypt in 1913 to power an irrigation system. A further breakthrough came in 1968 with the first large-scale power station and currently the largest is a 354 MW plant in Southern California. Spain is also a major investor in CSP and leader in its development. "The project will utilize solar parabolic trough technology to generate electricity. With this technology, arrays of parabolic mirrors collect heat energy from the sun and refocus the radiation on a receiver tube located at the focal point of the parabola. A heat transfer fluid (HTF) is heated to high temperature (750°F) as it circulates through the receiver tubes. The heated HTF is then piped through a series of heat exchangers where it releases its stored heat to generate high pressure steam. The steam is then fed to a traditional steam turbine generator where electricity is produced. " The advance is the size of the plant, and the use of High-Voltage Direct Current (HVDC) to transmit the electricity long distances to where it is needed. Alternating Current (AC) power lines suffer from considerable transmission losses which make it unfeasible to build such power stations now, as the best places for generating the power - deserts - are usually a long way from population and industrial centres which would utilise it. Projections are that this technology could take off and economies of scale, together with advances in the materials and efficiency of the power plants could make it a seriously viable low-carbon source of energy for the future.